This piece combines two interviews from 2015 and 2016. Daniel Willingham, a psychologist at the University of Virginia and the author of Raising Kids Who Read, doesn't champion reading for the obvious reasons — not because research suggests that kids who read for pleasure do better in school and in life. We've talked to Willingham a few times over the years — about his book, and his tips for helping kids choose reading and eventually see themselves as readers. Here's what he's had to say. One of the things I hit hard in this book is the idea of creating a sense in the child that this is what we value in our family. I think a lot of parents don't appreciate what a powerful message that can be for kids — like the things that are on your wall, the rules you set in your household, who parents talk about as the people they respect. You should model reading, make reading pleasurable, read aloud to your kid in situations that are warm and create positive associations. But also setting a tone where our family is one where we like to learn new things. We like to learn about the world, and a big part of that is reading. Some people say, "This should be off the table," or "This is terrible." I wouldn't go that far, just because I'm always a little uncomfortable pretending that psychologists have the absolute answer to anything. My recommendation is, maybe don't try it first. 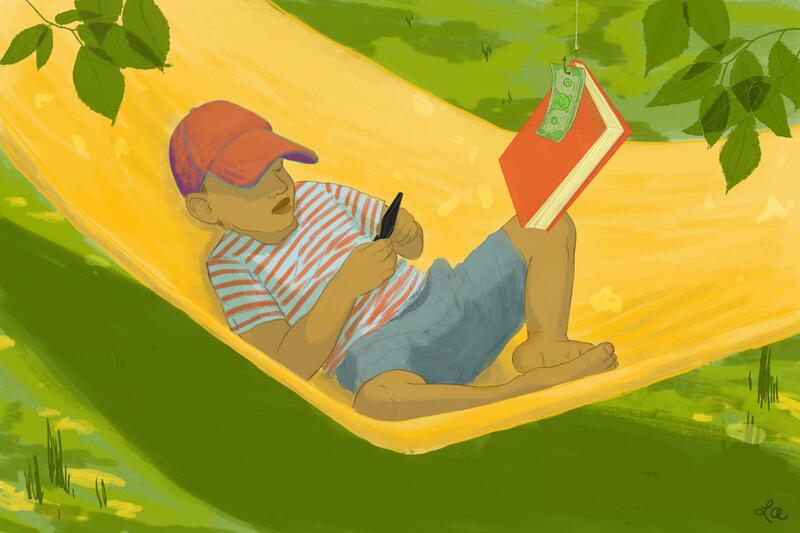 Money has the potential to change a child's attribution about why he would read and why he has read in the past. When you offer kids rewards, there's the potential for them to think, "The reason I read is because I'm offered a reward." Therefore, what's going to happen when you eventually stop the reward? The child is going to figure, "There's not really any point to reading. I wasn't reading because I liked it. I was only reading to access the reward." You have to see yourself as a reader. You can have an attitude that reading is a good thing to do and that reading makes you smart. And that's the thing, I think most kids know that. But they don't read. It's the same as someone who knows broccoli is really healthy, but sorry, I just don't like it. Another example is: I have a really good attitude towards exercise. I never do it, but my attitude towards exercise is wonderful! And so talking about kids' reading attitudes is important, but it's only part of the picture. I think self-concept really matters. You have to see yourself as a reader. Because graphics novels have only become super-common in the last five or 10 years. I think, in general, I'm a big fan of graphic novels if they can be a gateway drug — just to reach kids who think that print is not worth their time. Here is something that is print that they think is worth their time. I think getting to other reading material will come. I'd be fine even if graphic novels were the mainstay of my child's reading diet. My recommendation is, if you really want your child to choose reading, there are two strategies you can use. One is, you can look at environments that are already impoverished environments, where there's not much to do, and put books there — like the car, like the bathroom. My wife's a teacher, and she tells parents all the time: Put books in your child's bathroom. And it's amazing how much kids will read when there are books in the bathroom. The other thing you can do — and I hate to put it this way — is impoverish the environment your child is in. And that means restricting other things they can do. It's not really coercing reading. Restricting screen time is an obvious version of that. The other thing I recommend, when you're talking about little kids, is when they give up their nap, it's very smart to institute quiet time. So it's like, "No, you don't have to sleep. You're too old for a nap. But you're gonna go in your room and have a half-hour of quiet time." And that's a time when a child who is too young to read could well be looking at picture books. And I know families where quiet time goes through grade school. Getting back to the summer, another way you could implement this strategy — and you really need to do this at the beginning of the summer — is to say, "Okay, here's the summer. This is great. You're out of school. But the weekdays are not gonna be a free-for-all. There's still gonna be some structure." We've done this in our house at various times. So you think about the categories of things you'd like to happen. Maybe one of the categories is contributing to the house — basically, household chores. Or, once a week we're going to have some kind of an adventure. We're going to go in the car and we're all gonna go someplace we've never been before. And then one of those categories you're thinking about could easily be fulfilled by reading. So, in the middle of the afternoon, when it's hot, if we're not at the pool, that's when we're gonna do some sort of quiet, indoor activity — maybe it's reading, maybe it's games. This is a way of doing a soft restriction of children's activity as a way of encouraging reading.